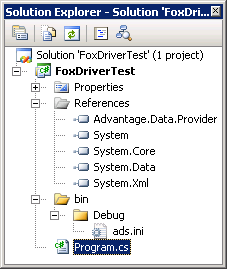 In one of my projects I have to read FoxPro DBF-files and import data from them. As this code must run in server and customer doesn’t want to install FoxPro there we found another solution that seems at least to me way better. In this posting I will show you how to read DBF-files using Sybase Advantage data providers. I downloaded and installed .NET data provider and my example here is fully based on this. Error 5185: Local server connections are restricted in this environment. See the 5185 error code documentation for details. Make sure you add reference to Advantage data provider assembly and include ads.ini to your project like shown on image above. Here is short code example about how to get data from DBF-file to DataTable. If Advantage data providers were installed correctly and there are no errors in table names, locations and your SQL query then you should see list of table column names and row count on console window when you run the application. Published at DZone with permission of Gunnar Peipman , DZone MVB. See the original article here.